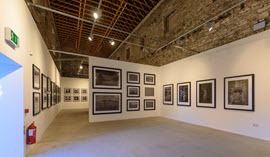 Irish photographer, Giles Norman, launches a large-scale exhibition in the historical Old Mill Building to celebrate his gallery’s 30th anniversary. When renowned photographer, Giles Norman, rented a darkroom space in Kinsale in the early ‘80s, both locals and tourists flocked to the tiny window of his studio, which offered a glimpse into his growing portfolio. This welcomed curiosity encouraged Giles Norman to open his first gallery in Kinsale 30 years ago in 1988. This month-long exhibition will take visitors on a journey through Giles’s expansive portfolio from his early analogue years, through to the advent of the digital era, and the launch of his new Aran Islands 2018 and Rome 2018 collections. Both his Irish and international collections will be on display, exhibiting Ireland’s dramatic landscape, alongside street scenes from the world’s greatest cities and bold abstract pieces. With unique insights into his influences and experiences as a photographer, alongside a video installation featuring a behind-the-scenes look into Giles Norman’s process, this is an exhibition for both admirers of his images and photography enthusiasts. Opening Hours: Daily from 12.00 (midday) – 18.00, or by appointment outside these hours; to book an appointment, contact [email protected] or 021 4774373. Visitors can order Giles Norman photographs from this exhibition site; Giles Norman Photography offers a world-wide-shipping service. This exhibition is kindly supported by Creative Ireland and the Arts Office, Cork County Council.